If you haven't heard that a SIDS prevention method has been 100% successful since 1989, you are not alone. Most of us have heard the results of the Back to Sleep campaign, which often takes credit for the reduction in crib deaths across the globe. While this campaign has helped reduce crib deaths, it is not 100% effective. Only mattress wrapping has been proven 100% effective in preventing crib death. How is this possible? And WHAT is mattress wrapping?! Mattress wrapping is based on the toxic gas theory. The theory states that toxic nerve gases permeate from all used mattresses: crib, bassinet, adult mattresses and even sofa cushions. The gases are created when fungus grows inside the mattress (or foam) and eats certain elements in the mattress, including phosphorus, arsenic, and antimony. Babies, especially those sleeping on their stomachs, breathe in the toxic nerve gases, which results in crib death, or SIDS. 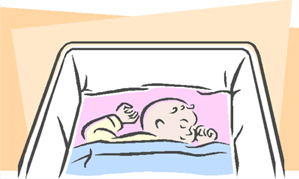 Mattress wrapping, which is essentially wrapping the mattress in a polyethylene cover, prevents the gases from getting into the baby's breathing space. The polyethylene sheeting does not allow the gases to permeate, thereby preventing inhalation and subsequently preventing crib death. Continue reading this blog to learn how this theory has been scientifically proven and what you can do about it! Like most people, you are probably wondering why in the world you should trust this "theory" and what you are reading. After all, TONS of other websites by notorious doctors and even SIDS organizations ignore this theory! Let me assure you that the toxic gas theory is not just a theory anymore; it is pretty well proven to be the cause of crib death. During the "BabeSafe Campaign" not ONE baby who slept on a wrapped mattress died in his/her crib. Do not take this information lightly. The BabeSafe Campaign has been under way since 1995. That's right: since 1995 not ONE baby has died from "SIDS" on a wrapped mattress. It is estimated that at least 235,000 babies have slept on wrapped mattresses. With a moderate SIDS rate of 1/1000 babies, statistically 235 babies should have died! Statistical proof that mattress-wrapping prevents crib death (as calculated by statisticians at the University of Munich): p = less than 1.9 x 10^-22. In mathematical terms, this is more than one billion times the level of proof which is usually regarded as establishing a medical proposition. Sadly, this well-intentioned measure was counterproductive in two ways. (1) American SIDS deaths ballooned 400-fold; the toll has since declined. (2) Among knowledgeable observers, it is well known that the number of baby deaths in residential blazes multiplied. Statistical evidence, unfortunately, is not available. The mechanism of death is identical in both types of tragedy: the generation of extremely poisonous gases from the chemicals that had been added -- in all innocence. First, with regard to SIDS. Common, ordinarily harmless household fungi such as Scopulariopsis brevicaulis and certain microorganisms consume the phosphorus, arsenic, antimony, added as fire retardants and plastic softeners. In consuming the chemicals, the fungi emit the heavier-than-air neurotoxic gases based on phosphine (PH3), arsine (AsH3) and stibine (SbH3). These gases are about one thousand times more poisonous than carbon monoxide, which can kill a person in a closed garage with a running engine. They are about as toxic as Sarin, used in the 1980s Iran-Iraq war and in a Tokyo terrorist subway poisoning in 1995. In probably the worst environmental disaster of the 20th century, these toxic gases have killed about one million victims of SIDS worldwide. Gas generation starts when a mattress, containing both the chemicals and the fungi, is warmed to body temperature in contact with the baby. Perspiration, dribble, urine, vomit, body heat and -- as we shall see, critically important -- high (alkaline) pH enable the fungi to grow and generate gas rapidly. If a mattress contains any antimony, for example, there is invariably more than enough, when converted to stibine, to kill a baby. Breathed for an extended time even in minute quantity, these nearly odorless gases can interrupt the choline/acetylcholine transfer of nervous impulses from the brain to the heart and lungs. That shuts down the central nervous system; heart function and breathing stop. Most of these gases (phosphine is an exception, details below) remain in a thin layer on the baby’s crib and diffuse away. But if enough gas accumulates to a fatal dose, the parents know nothing of it until their terrible discovery, typically the next morning. The attendant psychiatric morbidity from needless guilt reactions is enormous. Every parent of a small baby or parent-to-be is wondering, "Will my child become a statistic? Will he/she have to die because of something I did or did not do?" Older children are less at risk because the gases cause them to develop a headache and call for help. For physiological reasons, adults are not put at risk by such gas generation. After decades of research and practical proof (NO crib deaths on BabeSafe mattresses or wrapped mattresses) we can confidently refer to the toxic gas "theory" as the toxic gas "explanation" for crib death. The proof is overwhelming that wrapping a baby's mattress is the #1 crib death prevention technique that all parents must practice. The statistical proof can no longer be ignored! Analyses of bedding reported by Jim Sprott in The Cot Death Cover-up? (Penguin Books, New Zealand 1996, Britain 1997). The finding of the rising risk of cot death from one sibling to the next refutes every proposition that cot death has a medical cause. The more times an unwrapped mattress is used from one baby to the next, the greater is the risk of cot death. This accounts for the higher cot death rate among poorer families, who are more likely to sleep their babies on previously used mattresses. If a mattress contains any of the elements phosphorus, arsenic or antimony, and if certain household fungi have become established in the mattress during prior use, any generation of toxic gas commences sooner and in greater volume. All studies which show that face-up sleeping reduces the risk of cot death (of which there are many) support the toxic gas theory. Face-up sleeping reduces the risk because the gases concerned are more dense than air; they diffuse away from a baby's mattress towards the floor, so a baby sleeping face-up is less likely to ingest them. Any part of a baby's mattress which contains the chemicals phosphorus, arsenic and/or antimony is capable of the gas generation which causes cot death. If, therefore, a mattress is covered with a gas-impermeable diaphragm which does not contain those chemicals, the risk of cot death is eliminated. Accordingly, following removal of those chemicals from British plastic-covered mattresses from 1989 onwards, the risk of cot death in Britain is less on PVC-covered mattresses (which are very frequently used in Britain). Thus the finding by the CESDI study that babies are less at risk on PVC-covered mattresses supports the toxic gas theory for cot death. Jim Sprott, The Cot Death Cover-up? (Penguin Books, New Zealand 1996, Britain 1997). Giftige Gase im Kinderbett (Toxic Gases in Infants' Beds), Zeitschrift fuer Umweltmedizin (Journal of Environmental Medicine) 2002; 44:18-20. Compounds of the elements phosphorus, arsenic and antimony are very frequently present in bedding. In some instances they are added as part of the manufacturing process (e.g. for fire retardant or plasticising purposes). In other instances they occur naturally (e.g. in sheepskins, kapok and tree bark). Action of household fungus on these compounds can produce extremely toxic nerve gases. These are, respectively, phosphines from compounds of phosphorus, arsines from compounds of arsenic, and stibines from compounds of antimony. These gases shut down the central nervous system, resulting in cessation of heart and breathing function, and thereby causing death. Analysis showed that all three elements were present, phosphorus being especially prevalent. Sheepskins were shown to contain all three elements. Infant car seat cushions. Abandon the fairly new practice of carrying your baby around in his infant seat from stop to stop. The more often your baby is in it, sweating, urinating, spitting up, the more dangerous the seat becomes. Wash the padding frequently to prevent fungus from growing inside the padding which leads to toxic gases. Infant swing padding. Same as above. Wash frequently or don't use. Padded furniture such as a couch. Never sleep with baby on a couch/sofa. Pillows. Polyester or other synthetic filled pillows are horrible! Your bed. Just like baby mattresses, in the US, all beds are mandated to be fire retardant and also often contain polyester. Organic cotton mattresses are available with a doctor's prescription. Never sleep baby on your bed. Use a co-sleeper instead. Polyester fleece or poly filled comforters or quilts. Do not use any synthetic bedding for baby whatsoever. Following is an overview of the 1998 UK Limerick Report regarding the toxic gas theory for crib death (the Richardson hypothesis). Contrary to publicity, the Report did not disprove the theory - in fact, it provides further confirmation of it. At the end of 1994 the British Government faced huge potential legal claims by bereaved parents. In the 1980s the Government had required manufacturers to include a fire retardant in cot mattresses, and had approved antimony trioxide for the purpose. The result was the generation within crib mattresses of stibine gas, which caused thousands of cot deaths. If the Limerick Report had supported the toxic gas theory for cot death, the British Government would have been liable for millions of pounds in damages. What did the Limerick Committee investigate? They investigated whether certain toxic gases are generated from fire retardant chemicals contained in PVC-covered crib mattresses. Was this a full investigation of the toxic gas theory for crib death? The Committee did not investigate any mattresses other than those covered with PVC. They did not investigate natural products used as bedding (despite the fact that many crib deaths occur on such materials, e.g. sheepskins). They focused on only one of the three relevant gases (stibine). Is the Limerick Report relevant in New Zealand? Largely, no. This is because PVC-covered mattresses are very rarely used in New Zealand. Sheepskins (which are frequently used as baby bedding in New Zealand) were specifically excluded from the study. New Zealand mattresses very rarely contain fire retardants. The toxic gases most likely to be generated from New Zealand baby bedding (phosphines and arsines) were not focused on in the study. How then does the Report provide confirmation of the toxic gas theory? It confirms (yet again) the gas generation which causes crib death: the Committee achieved generation of a form of stibine. Other researchers had already proved the generation of all three gases: phosphines from phosphorus, arsines from arsenic and stibines from antimony. But the Report's conclusion states that the toxic gas theory is unsubstantiated. Why? The Report stated that one particular fungus which can cause gas generation (S. brevicaulis) was not found on any mattresses on which babies had died of cot death. Irrelevant. The Committee found S. brevicaulis and many other micro-organisms on crib mattresses - and a number of these are capable of generating toxic gas if phosphorus, arsenic or antimony are present in a mattress. Whether babies had died on the mattresses tested by the Committee is immaterial. Household fungi become established in nearly every mattress which is slept on, and in underbedding which is washed infrequently. The Report stated that what Richardson had identified as a fungus was actually bacteria. Irrelevant. Bacteria as well as fungi can generate toxic gas from the chemicals concerned. The Report stated that while toxic gas was produced under laboratory conditions, no gas could be produced in cot conditions. Irrelevant. Gas generation has already been achieved in crib conditions, and failure by the Limerick Committee to do so doesn't negate this fact. Various researchers have found it difficult to achieve gas generation consistently using media with a neutral pH. But the pH of a cot mattress is often higher, owing to the conversion of urea to ammonia. Experiments carried out using high pH (say, 10) have achieved more consistent gas generation. In these tests fungus flourished and the amount of gas produced was greater than at neutral pH. The Report stated that cot death babies did not show the typical physiological effects of phosphine, arsine or stibine poisoning, e.g. haemolysis and pulmonary oedema. Of course they didn't. Babies die so quickly from this type of poisoning that these effects don't have time to develop. Haemolysis, for example, takes many hours to develop; so does pulmonary oedema. But this gaseous poisoning can kill a baby within minutes. The toxicological data contained in the Report relates to adults and older children. None of it relates to babies - and it is well known that babies' blood and physiological responses differ materially from those of older children and adults. The Report stated that crib death babies had the same amount of antimony in their body tissue as babies who had died of other causes. Wrong. Research carried out in 1994 showed that post mortem body tissue of crib death babies contained many times more antimony than tissue of babies who had died of other causes. The Report stated that antimony present in the tissue of crib death babies could have come from many sources other than their mattresses. Wrong. The same 1994 research showed that the body tissue of babies who had died of causes other than crib death contained no detectable antimony (or in one case very little). If the Report were correct, there would have been similar amounts of antimony in the tissue of all the babies tested, whether they had died of crib death or of other causes. The highest crib death rate in Britain (2.3 deaths per 1000 live births in 1986-1988) coincided with the highest concentration of antimony in crib mattresses. The British Government had required a fire retardant to be incorporated in crib mattresses by 1988. Manufacturers were given four years' warning and during this period moved towards compliance with the new standard. The Report stated that the steepest fall in cot deaths in Britain occurred when antimony was very prevalent in crib mattresses and coincided with the "Back to Sleep" campaign. Highly misleading. Certainly the British crib death rate fell while the amount of antimony in mattresses was high - but that was because from mid-1989 onwards parents took preventive measures against toxic gas generated in their babies' mattresses. Furthermore, manufacturers began to remove antimony from mattresses. In June 1989 the toxic gas theory was publicized nationwide and the crib death rate immediately began to fall (see graph). It had fallen 38 % (to about 1.4 deaths per 1000 live births) by the time "Back to Sleep" was launched in December 1991 - two-and-a-half years later. The fall was steepest following the commencement of "Back to Sleep" because that campaign added to the success already being achieved by advice based on the toxic gas theory. What about the claim in the Report that three babies have died of crib death on polythene-wrapped mattresses? This claim is unsubstantiated. The types and thicknesses of the plastic are not known. Was it thick, clear polythene (safe) or thin or coloured polythene (unsafe)? Was there bedding containing phosphorus, arsenic or antimony on top of the plastic? Were sheepskins used? Or mattress protectors? These questions have not been answered, and without this information the claim is not valid. In February 2000 Dr Peter Fleming, a co-author of the Limerick Report, stated that the claim that three babies had died of crib death on polythene-covered mattresses could not be substantiated. Are there other findings which support the toxic gas theory? The conclusions of the Limerick Report should be disregarded. Other researchers have disproved them; and so has the practical experience of mattress-wrapping in New Zealand. Since late 1994 many tens of thousands of New Zealand parents have wrapped their babies' mattresses for cot death prevention, and since that time the New Zealand crib death rate has fallen markedly. The practical experience of mattress-wrapping proves the toxic gas theory for crib death. If mattress-wrapping did not prevent crib death, many deaths would have occurred by now on polythene-wrapped mattresses. THERE HAS NOT BEEN ONE REPORTED CRIB DEATH ON A BabeSafe MATTRESS COVER OR BabeSafe MATTRESS. After being static for three years, the NZ crib death rate immediately began to fall. From 1994 to 2011 the nationwide rate fell by 80%. The reduction in the NZ European ethnic rate over the same period was even greater: about 91%. These major reductions in crib death cannot be attributed to the SIDS prevention advice publicized by the New Zealand Ministry of Health and the New Zealand Cot Death Association. There has been no material change in that advice since 1992. Sales information relating to BabeSafe mattress covers shows that a very large number of New Zealand babies (and at least 235,000 total) have slept on wrapped mattresses, and also that mattress-wrapping has been enthusiastically adopted by NZ European ethnic parents. The Ministry of Health has confirmed that mattress-wrapping is more prevalent among this community than among other ethnic groups. A considerable body of research has been reported which supports the toxic gas theory for crib death (on which mattress-wrapping is based). Contrary to media publicity, the 1998 UK Limerick Report did not disprove the toxic gas theory, a fact which has been confirmed in the New Zealand Medical Journal. In fact, the Limerick Committee's experiments proved the gas generation on which the toxic gas theory for crib death is based. Parents, however, are more interested in the practical proof: no reported SIDS death on a correctly wrapped mattress. Medical researchers regard “p” less than 0.01 (10-2) as good proof of a scientific proposition; and "p" less than 0.001 (10-3) as virtually certain proof. Put another way, the statistical proof that mattress-wrapping prevents crib death is one billion billion times the level of proof which is generally regarded as constituting certain proof of a scientific proposition. You will not find these facts on most SIDS organizations' websites, but these are the things you REALLY need to know about SIDS. SIDS is not a medical problem. According to the toxic gas theory, it is caused by gaseous poisoning. The gases concerned are phosphines, arsines and stibines, all extremely toxic nerve gases. They are produced in a baby's crib mattress (or any other bed where the baby sleeps) when fungus growing in the mattress consumes compounds of phosphorus, arsenic and antimony present in the mattress (and in certain other bedding). Babies can be protected from this gaseous poisoning when their mattresses are wrapped in a BabeSafe mattress cover. NO babies sleeping on wrapped mattresses have died of SIDS. Breastfeeding does not prevent SIDS. Some countries with high breastfeeding rates have high rates of SIDS, and countries with low breastfeeding rates have had low rates of SIDS. SIDS is not caused by parental smoking . While it can be considered a risk factor, if a baby sleeps on a wrapped mattress, whether or not the parents smoke is irrelevant to SIDS. Sleeping face-up is only a partial preventive against SIDS - many babies have died sleeping face up on unwrapped mattresses. The gases can still go through the baby's skin, and there is the additional risk of babies turning over in their sleep. The danger of SIDS increases as an unwrapped mattress is re-used from one baby to the next. 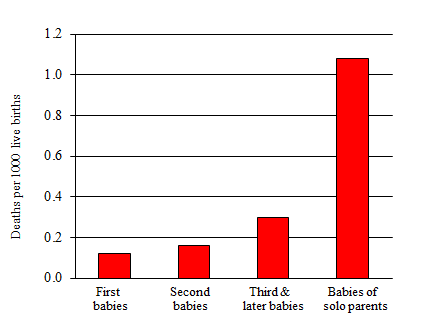 The data in this graph repeats year after year, and is typical of data from other countries where crib death occurs. 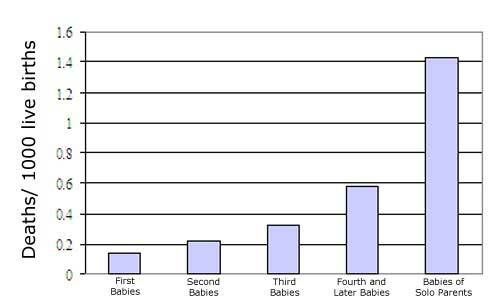 The graph destroys all propositions for the cause of crib death relating to babies themselves (genes, illness, vaccination, smoking, physiological deficiencies, etc). It forms part of the extensive proof that poisoning by extremely toxic nerve gases is the single cause of crib death. It fully explains and is completely compatible with, the toxic gas explanation for crib death. If a mattress (or other bedding) contains any compounds of phosphorus, arsenic or antimony, and if certain household fungi grow in the mattress (or bedding), the gas/es which cause crib death can be generated. And if fungi have become established in the mattress during previous use by another baby, the generation of toxic gas commences sooner and in greater volume when the mattress is re-used. This science accounts for the rising rate of crib death from one sibling to the next. It also accounts for the very high crib death rate among babies of solo parents, who – for economic reasons – are more likely to sleep their babies on previously used mattresses. The Cot Death Cover up? Who is Dr. TJ Sprott?